Working on new back-end for IAS. Growers can map all sensor devices, track historical data, set threshold, and state change alerts on all data, plus locate their device via GPS if their farm is really large! 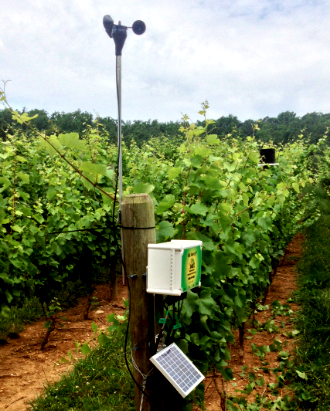 Early version of AlertII in a Vineyard. IAS AlertII(TM) can accept many environmental sensors, including SDI-12/Decagon, pulse/count, Dallas 1-Wire, 0-5V, 4-20mA, RS485 and others. For monitoring grape production, one key environmental factor is leaf-wetness. Monitoring leaf-wetness can provide some prediction of fungal infection, and allow for proactive treatment.